Tab dividers, and tabs customized to meet your needs. printed on index weight stock in various colors. Tab dividers can be ordered in tab sets or individually; they can be collated as a set or individually packaged. 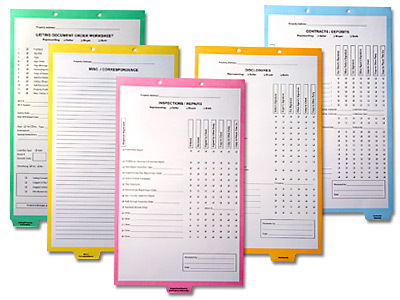 Tab dividers can be color coded for easy recognition and simplified organization. Print detailed information on each tab as needed to meet your specific needs. Punching and extra folds can be added so the tab dividers can easily be inserted into transaction folders. Tab dividers are customized with the number of tab cuts you specify. Tab cuts can be coated with mylar for additional reinforcement if required. Perfect for inserting into a classification folder or escrow folder used in a real estate transaction. 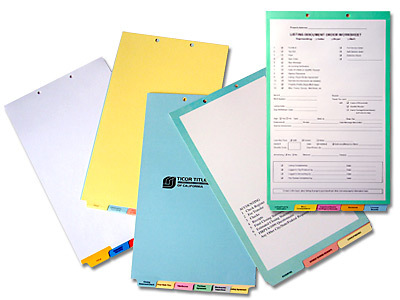 Tab dividers can make organizing paper intensive transactions much easier. Multiple tab positions available on either the short side or the long side.